At Zeik Dental, we offer our patients general and family dentistry services, providing our patients with personalized service. Our patients are part of our extended family. We work in a soothing environment and make every effort to ensure that both adults and children experience a pleasant dental visit. We have tried to look less like a dental office and more like a home while still maintaining the highest degree of infection control. When you visit us for your regular check-up or dental treatment, you are our special guest. Our staff members treat you with kindness and go out of their way to make you as comfortable as possible. We want your time with us to be an enjoyable experience. Preventative care is an integral part of what we do. We’ll give you and your children the tools you need to maintain healthy teeth and gums. 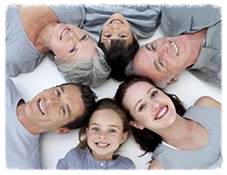 For friendly family dental care, trust Zeik Dental. Learn more about our dentist Dr. Nicholas G. Zeik. Our office provides comprehensive dental care for adults and children. Periodontal disease (gum disease) is caused by bacteria. If your gums feel tender, look red and swollen or bleed every time you floss, you could be at risk. Untreated gum disease has been linked to an increased risk of heart attack and stroke, so it’s important to keep up with your biannual dental checkups and cleanings. Appropriate treatment can slow or stop the progression of gum disease. Since there are different stages of gum disease (from gingivitis to advanced periodontitis), there are different levels of treatment. We specialize in non-surgical treatment of gum disease which is highly effective for early to moderate periodontal problems. While surgery is sometimes still the best option, we can now treat many cases with less invasive techniques such as local antibiotics, deep cleanings, medicated rinses and laser treatment.